Tom Brady’s two touchdown passes in Sunday’s 51-17 win over the Jacksonville Jaguars put the New England Patriots quarterback in rare air among NFL signal callers, as he eclipsed 400 career touchdown passes. Brady, who now has 401 career touchdown passes, became the fourth NFL player in history to reach 400 career touchdowns. 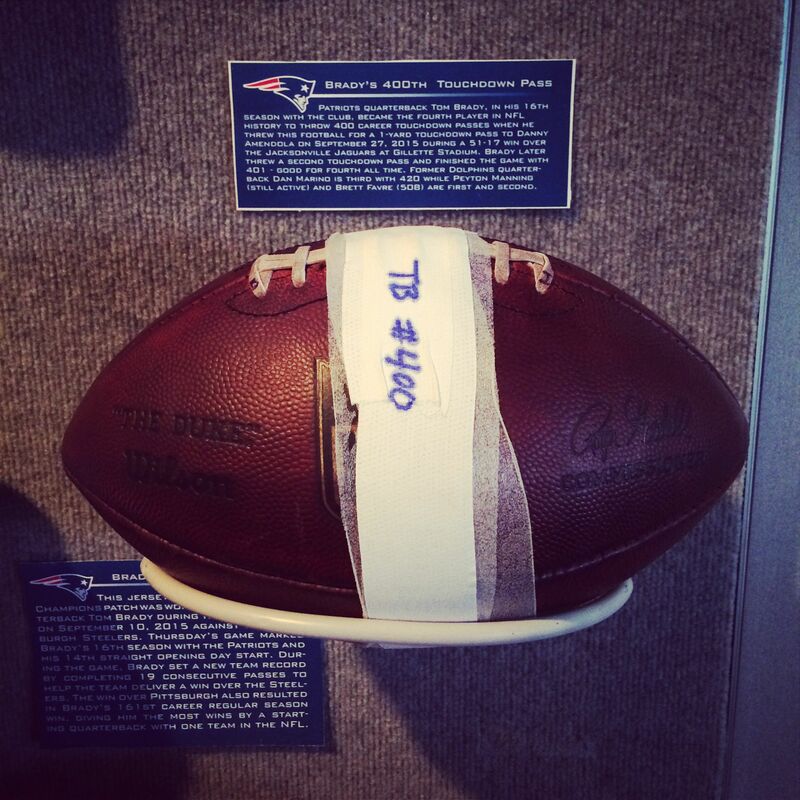 The ball Brady threw for his 400th career touchdown pass – a 1-yard strike to wide receiver Danny Amendola in the second quarter – is now on display at The Hall at Patriot Place presented by Raytheon. Brady threw his first career touchdown pass on Oct. 14, 2001 when he connected with wide receiver Terry Glenn against the San Diego Chargers at Foxboro Stadium. Nearly 14 years later, the future Hall-of-Fame quarterback has thrown 401 touchdown passes to 56 different receivers. His favorite target has been tight end Rob Gronkowski, who has been the recipient of 57 Brady touchdown passes. Wide receiver Randy Moss (39) and wide receiver Wes Welker (34) are second and third on his list of top targets. Between the 401 touchdown passes, Brady has set franchise and NFL records, won two NFL MVP awards, three Super Bowl MVP awards, six AFC Championships and four Super Bowl titles. The Hall, which preserves history as it’s made by displaying artifacts from milestones and record-setting performances that occur throughout each Patriots season, is open Monday through Friday from 10 a.m. to 5 p.m., Saturday from 10 a.m. to 9 p.m. and Sunday from 10 a.m. to 7 p.m. Check www.thehallatpatriotplace.com for schedule changes and closings. Admission is $10 for adults, $7 for seniors and active military with ID and $5 for children ages 5 to 12.